David Bowie concert ticket from 11th August 1997. Shepherd’s Bush Empire. Very good condition for 21 years old. and only the new drum and bass album stuff. Used concert ticket for David Bowie's performance at Riverport Amphitheatre 11 October 1995. David Bowie Ticket Stub Glass Spider Tour August 1987. CNE Stadium. Condition is Very Good. 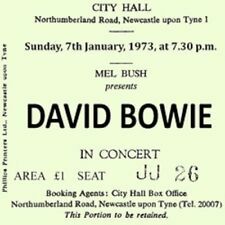 David Bowie features on this ticket coaster from a concert at the City Hall in January 1973. Concert Coasters High quality mdf coaster. Coaster size 95mm x 95mm (3.7” x 3.7”). · 3mm thick mdf that is laser cut around the edges. 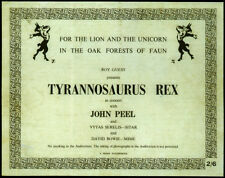 THE LION AND THE UNICORN IN THE OAK FORESTS OF FAUN TOUR - FEBRUARY/MARCH 1969. DAVID BOWIE & T REX REPRO 1969 CONCERT TICKET. DAVID BOWIE. DAVID BOWIE & EARL SLICK. LET'S DANCE TOUR 1983. MILTON KEYNES BOWL, 2ND JULY 1983. (Not Originals). A great way to obtain an affordable copy / reprint of a star's autograph. SIGNED PHOTO PRINT. 18 October 1997. No reserve. The scan does not do the item justice. Used concert ticket for Tin Machine @ Utrecht Vredenburg 28 October 1991. Beer stained! 17 November 1991. The scan does not do the item justice. Concert ticket for David Bowie's performance @ Capitol Ballroom 7 September 1996. Concert ticket for David Bowie @ Great Western Forum 28 October 1995. 26 May 1990. The scan does not do the item justice. Rare ticket stub from the above concert. THERE ARE 2 WAYS IN WHICH I CAN HELP WITH THIS make Supersized seem small. Get images that. Paris, Bercy 1990 France. David Bowie Sound and Vision Tour. Ticket stub. Canal Productions. yellow discoloration line at the top . MARC BOLAN - T REX. FEATURING BOTH T-REX(MARC BOLAND) & DAVID BOWIE. DAVID BOWIE. THE ULTIMATE T-REX / DAVID BOWIE COLLECTABLE. RARE VIP CONCERT TICKET(1969). DONT MISS IT - VERY LIMITED AVAILABILITY.